A civil wedding in Florence in the historical Palazzo Vecchio is an unforgetable great experience for many couples. Many thousand couples a year choose to get married in Florence – the “heart of Italy”. The Palazzo Vecchio is the perfect setting for a Civil wedding in Florence. The ceremony in Florence will take place in one of the most prestigious palaces in Florence. Surrounded with original antique furniture and frescoes the Palazzo Vecchio is the perfect place to say “I do”. The Palazzo Vecchio in Florence has three different halls available for civil weddings: the Sala Rossa, Sala di Lorenzo or the imposing Salone de’ Cinquecento. 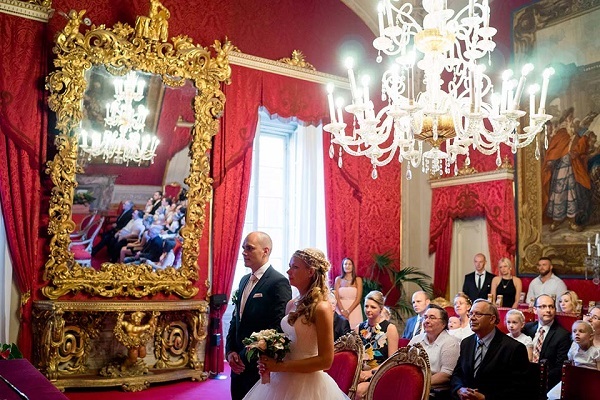 Other wedding venues in Florence for a Civil wedding are the Bardini Museum, the Villa Vogel or the Garden of the Roses. A civil wedding in Florence takes about 20 minutes. For a civil wedding in Italy the law requires also the presence of an interpreter and two testimonials. Our wedding planner in Florence will provide you with an interpreter, will help you with the paperwork and will plan and arrange every single aspect of a wedding in Florence. Please contact us for a tailor-made offer for Your wedding in Florence, Italy.